Seeker's Bad Science podcast explores the authentic astrophysics of director Alfonso Cuaron’s film, Gravity. The first 15 minutes of Gravity, director Alfonso Cuaron's 2013 sci-fi thriller, have earned a place as one of the most startling, wondrous movie experiences ever delivered to the multiplex. Floating in low-earth orbit, space shuttle astronauts Ryan Stone (Sandra Bullock) and Matt Kowalsky (George Clooney) are diligently making repairs to the Hubble Space Telescope. Complex trajectories swing the camera from long establishing shots to extreme close-ups. In one seemingly unbroken 15-minute sequence, we swirl in giddy delight, weightless inside of this carefully crafted hi-tech illusion of orbital physics. But then things go haywire: When the Russians blow up one of their spy satellites on the other side of the planet, it triggers a chain reaction of devastation that puts our peacefully floating heroes on a collision course with a cloud of orbital debris, coming in at 17,000 miles per hour. In this week's installment of Bad Science — Seeker's podcast on science at the movies — host Ethan Edenberg is joined by comedian Nicole Calasich and Liz Warren, associate program scientist with the Center for Advancement of Science in Space. 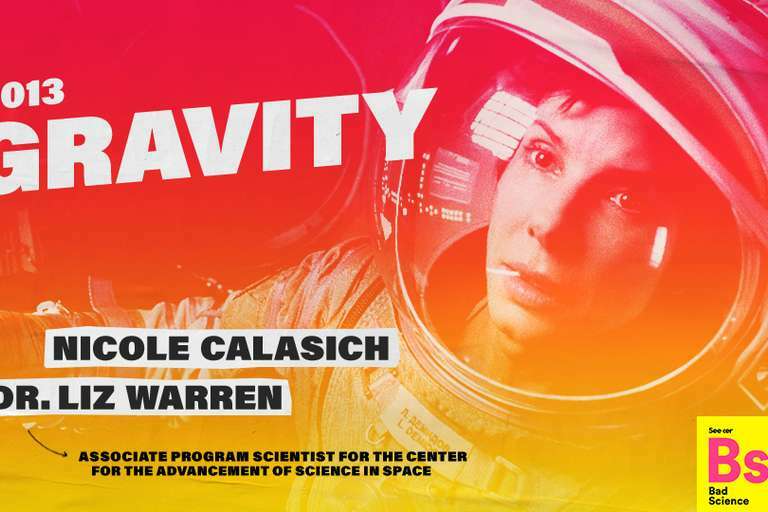 Warren often works with researchers and astronauts aboard the International Space Station, and she brings some intriguing insights to the hard science encoded within the blockbuster movie. For instance, that lethal debris field? It's a real problem. NASA and NORAD are among several agencies worldwide that track debris in space, Warren explained. And orbital trash is no joke, especially if you're on the International Space Station. Warren said space junk is largely pieces of older satellites that have long ago been abandoned into decaying orbits. Retrieving the trash is a major challenge, and different space agencies have proposed various solutions to the dilemma. Warren said the situation happens maybe twice a year aboard the ISS. In addition, the International Space Station is constantly being bombarded with micrometeorites — tiny bits of space rock that leave pings and dents in the station’s outward facing hull. “Luckily, it's got some good shielding to prevent serious damage,” she said. Tune in to Bad Science this week for more details on the modern classic Gravity, including some informed conjecture on what happens to the human body when it's exposed to the vacuum of space. “It's unpleasant,” according to Warren. As host Edenberg points out, Gravity is a particularly good subject for the Bad Science podcast treatment because the film’s producers worked directly with NASA and other space agencies to ensure accuracy. In other words, there's a lot of science in the movie, and it's not bad at all.